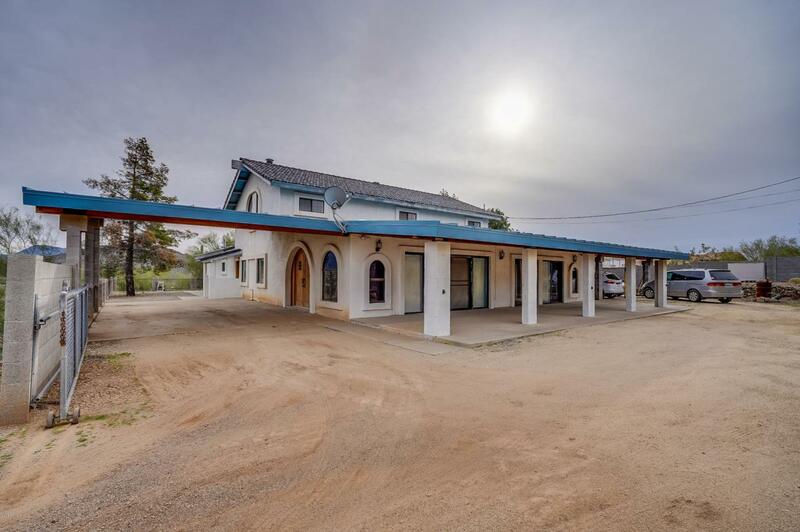 Enjoy gorgeous views for miles from this desert escape with mature trees on 1.1 acres, with an option to purchase 2.29 additional adjacent acres for $76k. Open, spacious floorplan has that quintessential Southwest feel with saltillo (terra cotta) tile throughout plus vaulted ceilings, wood beams and handsome real wood doors. Custom cabinets in kitchen wrap around to the spacious formal dining room. A spiral interior staircase leads to the master suite with raised jetted tub, snail shower, bidet and his and her showers! Did we mention views? Soak them up from the well-shaded balcony off the master. Lots of light and lots of room for indoor and outdoor privacy. All this and ample RV parking!